Aghaboe House a été terminé vers 1730. Il a été le foyer de la célèbre Irish antiquaire Edward Ledwich vers 1790. Ledwich était l'auteur des «antiquités de l'Irlande 'un deux volumes sertie de gravures spectaculaires publiés en 1795. Une copie vierge peut être inspecté par arrangement préalable. Les points de vue des attenante Aghaboe Abbey sont renforcées dans la nuit par des projecteurs. Les points de vue de la proximité Slieve Bloom Mountains, maison d'hiver de Finn MacCool et Fiana ou irlandais classe guerrière, sont spectaculaires de la terrasse arrière et la plupart des chambres et des salles communes. Le système de l'autoroute nouvellement achevés en Irlande rend la situation centrale de Aghaboe Maison une base idéale pour le tourisme. golf à proximité et des attractions historiques sont abondants. 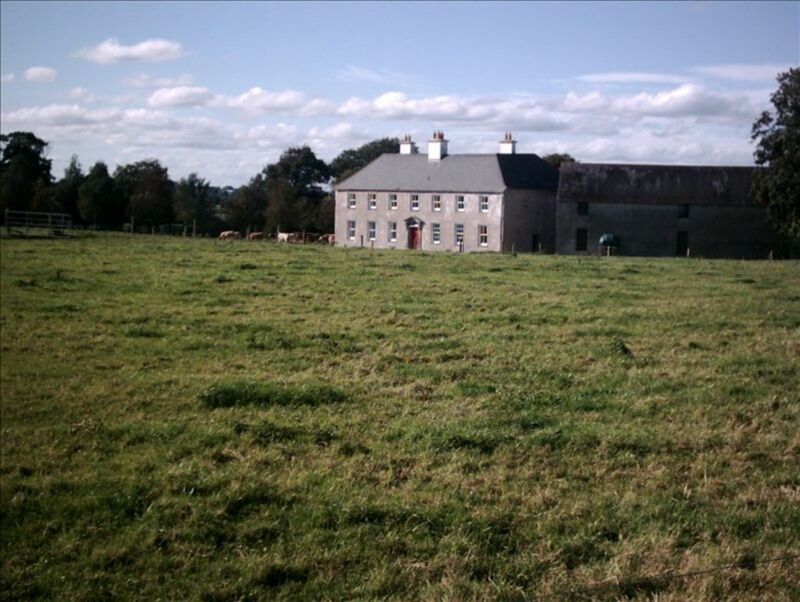 Si vous êtes à la recherche d'une véritable expérience irlandaise "Country Estate 'ce qu'il est. Grandes poêles à granulés américains garder la maison chaude et aérée. La grande fuel AGA poêle dans la cuisine est une expérience supplémentaire. Il y a un grand salon séparé et une grande salle à manger séparée ainsi que d'une manger dans la cuisine. Aghaboe Maison est à la fois unique et inoubliable. Our second visit and we'll be back! This house is massive and full of character. Our family of three generations used it as a home base while visiting family and different sites. There is so much room that we could even have visitors over and comfortably host. Our first visit was in May 2012 and second in November 2018, both times it was a bit chilly so it is a good idea to bring a couple extra layers or buy yourself a nice Aran sweater. Can't wait to go back! Aghaboe House is a Big House with twelve foot ceilings. We have an Aga in the kitchen on all of the time. We have an oil stove in the dining room. All of the bedrooms have large pellet stoves as well as the large sitting room. However, when it was used as a family home in 1730 with coal fires in each of the fireplaces al inhabitants did dress appropriately for the season. We do not usually rent in November but Corliss asked us to and we did our best to let them know that it might be "a bit chilly". However, when you rent a period house you are going back in time to a certain extent. I always wear a jumper inside after October. From late May through October it is comfortable and needs little heat to maintain that level. In fact, this summer I considered turning off the Aga as it was roasting inside. christy g.Where do you live? On arrival, the owner told us that he was living in the house. My husband mentioned we were surprised about this, since the listing didn’t mention it (saying; “a concierge/handyman living in a nearby building on the estate to assist you”). The owner said “It’s a big house” & that he’d respect our privacy but be available if needed. We asked for wash cloths & directions, but otherwise didn’t see/hear him. Owner is in room off main stairs. You must pass it which is uncomfortable late at night as things creak, & there is a feeling of waking the owner. It’s OLD & a work in progress. Paint on the windows waiting to be scraped off, unhung pictures about & a ladder was placed just outside two bathroom windows. Afraid of bugs or spiders? This home is not for you. Spiders we saw were ‘Daddy Long Legs’ (Opiliones - not harmful). Webs abound. There’s moths & house flies too. It’s not for ‘clean freaks’. Upon arrival I had to clean the tub, sink & countertop as all had definitely not been cleaned. Soap scum ring in tub & hair on sinks. Wanted to vacuum spider webs but didn’t want to offend/wake owner. Bed linens included pillow cases, fitted sheet & comforter, no top sheet. So (since they could not fit in the washer/dryer) you’re ‘sharing’ comforters with previous guests. We considered asking for top sheets, but when we requested washcloths we were given dish towels, so we decided to avoid asking for more. Hair from the previous guests was in beds. Washer/dryer takes around 7 hours to complete a cycle. A warning on the front says the dry function only works on ‘half load’. Shower works, but the tub water heater produced only about 4 inches of hot water before cooling down. The bedroom doors were solid, but lacked any method of locking them. We didn’t ask for keys to avoid offending owner. The bathroom doorways upstairs have no doors, only short curtains in the doorways. As the owner warned us - The main driving entrance to the property should NOT be used as an exit because attempting to drive out of it could be deadly due to it being on a ‘blind’ curve. It’s 1.5 hours from Dublin airport. In spite of it all, the rate was reasonable & we were thankful for the unforgettable experience. Duvet covers are changed for each letting and hairs were imperceptible to our cleaners. We have not provided top sheets in over 15 years of letting and never have had a comment on that. It should be noted that Duvet covers are separate and changed for every stay. If the comforter were to be soiled it would be sent to a commercial cleaner. Tub was cleaned and soap scum was not perceptible to our cleaners. Windows were just painted and oil based paint must dry before being scraped. They are now scraped. Ladder was left up to facilitate some repairs and bathroom windows were fully screened with stained glass panels. Ladder was never used when guests were resident. Yes, an old house (300 plus years) requires constant maintenance. Pictures are on tables titled against walls and will not be hung. There are over 20 hung pictures in house. These guests repaid my attempts to meet all of their needs by pulling down a well hung curtain rod with heavy curtains separating one bedroom from the bath. As to spiders. Anyone who has ever lived in a house with eight fireplaces and 12 foot ceilings knows they can never be fully eradicated. We constantly remove webs and vacuum nests. However, spiders are known to indicated a "dry" older house in Ireland and northern Europe. Face cloths are not typically provided but the Owner provided a variety of large and small clean cotton cloths upon request. Owner would have responded to any request for additional cleaning if asked. Finally, washing machine is standard European machine. Guests are not expected to transport large amounts of washing with them on a stay here. There are nearby large scale laundry facilities. The three hundred old house is a gem and a work in progress. Loved the quiet beautiful scene. If you are looking for a rubber stamped commercial rental, then this would not be for you. Mike has kept the history of the home and is a perfect host. I had wondered if this listing was for the "big house" or for a little house tucked to the side. This is for the ~BIG~ house, and you get to experience real rural Ireland! (we had a drought at the time and had to limit our use of the well water). There are spiders in every corner, dust in every floorboard, but you don't get a sense of being "dirty", just that the house is "old". The rooms are palatial, and the beds are very comfortable, but having the host live right next to the "kid's bedrooms" and having the parents two floors down and tucked in a corner just wouldn't fly for our family. It made me feel very uncomfortable with teenage children. Nothing against our host, Mike, who was very gracious and unobtrusive. It's just impossible to completely relax like I would have liked to. You know that feeling when you are living with your mother-in-law and you KNOW you can come and go whenever you want, but you always feel like you still have to ask permission to use anything, or that you need to let her know when you're going to be home late. It was awkward. All the amenities were in working order, the AGA stove was on the whole time, and worked like a charm. All the bathrooms were new and nice, the washer/dryer unit was fabulous, internet was good. If you are looking for a place to relax and let go, I would suggest a more private home. I recently brought a group of writers and actors from New York to Aghaboe House so that we could perform on the Word stage at the Electric Picnic and we had a wonderful stay. We loved the long driveway up to the house with grass growing in the middle of it, the field full of cows to our right, and the ruins of Aghaboe Abbey at the bottom of the hill. The house had plenty of room for our group of men and women artists and was even able to accommodate a couple with a child. The spacious kitchen was a great place to gather in the mornings as well as in wee hours of the night. We greatly enjoyed the living room as well, where we could sit by the fire and talk, eat and drink, rehearse scenes from a play, play guitar, and sing songs. There is also a large dining room that we never had a chance to use. Our host, Mike Fitzpatrick, was a font of information about Aghaboe House, the local area, and its history. He has even written academic research papers on the house and the nearby abbey. Mike was able to tell us about where we could shop for supplies, provide us with the numbers of cab drivers, and give us time-saving directions to the Electric Picnic, which helped us avoid traffic. I’d recommend Aghaboe House to any group or family looking to enjoy a quiet, hospitable visit to the countryside of the Irish midlands. Thanks for your review. Hope to see you and your group again sometime. A charming setting to remember! The mix-and-match decor was not of the period, but comfortable. I was disappointed that the AGA stove wasn't working, but the pellet stoves did a great job taking the chill out of the evening air. The layout is a bit awkward. The kitchen sink is in an adjacent scullery and the dining room is around the corner and down the hall. I suppose the original owners would have had servants and had no incentive to consider the floorplan! If you are looking for a spacious, country house, this is the one for you. Aga is under repair but often too hot for a good summer in any event. Furnishings are a bit eclectic but seem to work well for most. Glad Laura and family had a good stay. Kilkenny est à 35 miles de distance par des routes pittoresques.